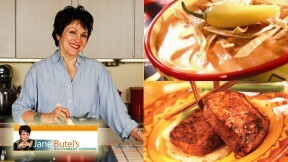 "Jane Butel's Southwestern Kitchen" will appeal to a very broad audience, the same audience that has made the southwestern taste the most popular in the United States! Jane Butel was the first to write about southwestern cooking and has written 16 cookbooks, six of which are best-sellers. A popular and engaging television personality, she has had three shows on ABC and NBC and has had her own southwestern vacation cooking school since 1983. She brings this experience to her new show, always educating the viewer on time-saving tips, using appliances for greatest advantage, cooking techniques and nutritional information. Her enthusiasm for making cooking fun is shared on the screen. Jane enjoys revealing tips for serving attractively garnished, delicious looking food that can be easily made, especially after watching her guide the viewer through the steps of preparation. The history of the cuisine and its major ingredients, chiles and corn, are highlighted. The historic influences gained from the Native American and Hispanic heritage along with the history of major dishes will be shared for all viewers to benefit. Long known for her clear and interesting presentation techniques, PBS audiences are sure to enjoy learning from Jane the flavors and fun of preparing their own fiestas with the greatest of ease.